Cable TV's political shows can help further democracy if viewers are also readers. I generally respect Chris Matthews as someone who keeps his biases to himself during interviews that are as tough on liberals as on conservatives. The other night the host of MSNBC's "Hardball with Chris Matthews" disappointed me by lobbing softballs to an ideological soul mate, Massachusetts Senator John Kerry. The questions directed at the Democratic presidential candidate were on the order of why he is so great and President George W. Bush so loutish. What particularly irked me — and caused me to exit the TV room for less partisan environs — was Matthews' asking several times how Kerry felt about the Bush assertion that he as president had never made any mistakes. Memo to Matthews: Bush said no such thing. When Bush was famously asked the question about his mistakes this month during a rare, prime-time press conference, Bush fumbled about without citing a specific mistake, but hardly declared himself error-proof. "I don't want to sound like I've made no mistakes," he explicitly said at the end of his reply, adding that he was perhaps "not as quick on my feet as I should be in coming up with one." The portion of the Matthews-Kerry interview that I saw was a reminder of the Matthews past, the fact that he had labored on behalf of Democrats for much of his adult life, including discipleship at the feet of such party honchos as President Jimmy Carter and House Speaker Tip O'Neill. I bring all this up not because I think Matthews is the worst host of the political shows on cable TV, but because he often seems much better than most of his competition, even if he likewise conforms to the religion of the 10-second answer. The producers of these shows are seemingly convinced that letting any guest speak for a whole lot longer is bound to bore TV viewers to the point of switching channels and tax their capacity for comprehension. The most popular of the cable news hosts is Bill O'Reilly of the "O'Reilly Factor" on Fox News Channel, which has the highest rating of the cable news networks. His oversized ego doesn't bother me much, seeing as how a shrinking violet would never make it in the business. He mostly strikes me as alert and knowledgeable, and I enjoy him in small doses, although I have yet to sense much depth. His way of arguing is essentially to repeat where he stands over and over, as if that is argument enough. While the show is successful at signing on interesting guests, I am not always sure that O'Reilly knows how to get the best out of them. The real issue for me about these shows is whether I feel I have learned anything after investing a half hour or more of my time. Sometimes, I don't, even when guests include experts on either side of some burning question and the questioners include both a conservative and a liberal. Shouting — a favored means of some guests for keeping the other guests cowed — is not discussing. Heat is not light. The medium is to some extent itself the problem. As the late Neil Postman once argued in a book called "Amusing Ourselves to Death," TV converts all it touches into entertainment; it gives visual flashes, a variant of the magician's "now you see it, now you don't," not the "sustained, linear" thought found in the printed word. Although the media that employ the printed word can obviously go astray in a variety of ways, the printed word has a quality of detachment from the subject matter, and consequently tends to promote objectivity and cautious reflection, Postman said. Despite all that, I think these cable shows are more healthy than not for our democracy, especially if the viewers are also readers and don't do as some young people reportedly do: confine their TV "news" watching to comedy shows. The more serious cable shows engage audiences in political issues, acquainting them with pro and con positions and putting political leaders under the spotlight. I would rather have citizens wrestling with these topics than not, and if they are simultaneously entertained, the world does not thereby come to an end. What seems to me important is that the political hosts keep getting better. They should aspire to what Chris Matthews accomplishes at his best, and when I say "they," I am also thinking of Matthews at his worst. 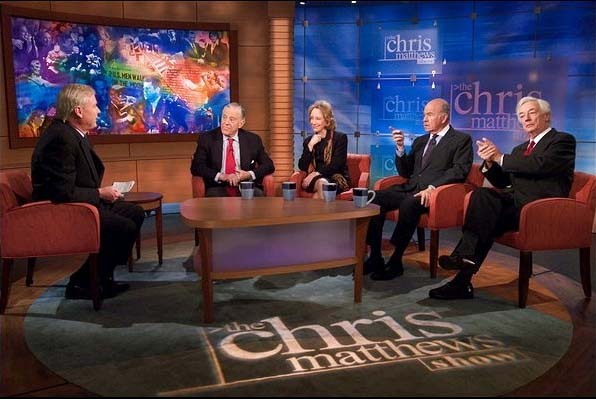 I am thinking of the Matthews who recently made a joke of his show's name while erroneously imputing to Bush an off-putting self-declaration of infallibility. Jay Ambrose is director of editorial policy for Scripps Howard Newspapers.